New Orleans is a perfect place to ring in a new year. Its not too huge or crowded like for a Mardi Gras or similar event, but with people in for new years as well as the Sugar Bowl, there are plenty of people around in a festive mood. 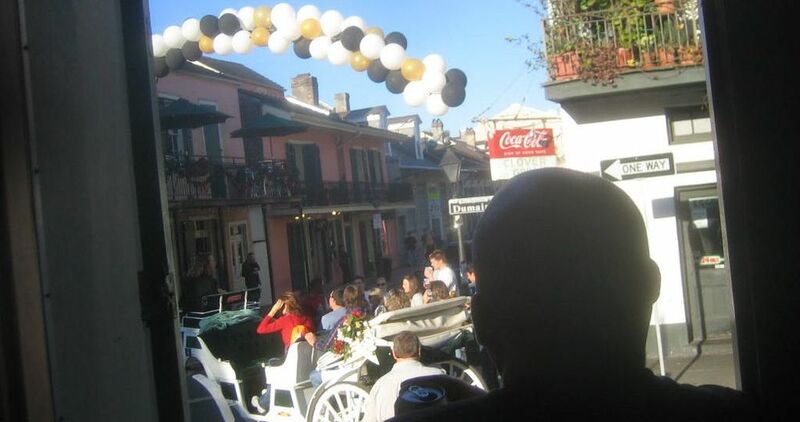 We opened our front door to find a balloon arch above the street just in front of our house as people began to fill Bourbon Street. Our muffaletta trek was successful this time, grabbing one at the Central Grocery where they were invented and eating it in the shadow of Joan of Arc in the Place de France. (I have to admit to liking the muffaletta at Franks, a couple doors down, a lot better.) From there we wandered through the Quarter to a party just outside (unintentionally taking the long way!) and then made our way back into the Quarter, stopping many places along the way. By midnight we had joined up with our friends Kevin and Dale and their group, and made our way to the levee to watch the fireworks over the Mississippi. Of course, in New Orleans, the party just begins at midnight. Suffice it to say it was long fun night.